The No. 1 retailer is believed to be pushing to launch its own digital movie service later this year. NEW YORK (CNNMoney.com) -- Wal-Mart, which has been eyeing the downloadable movie waters for some time, is now preparing to dive in. According to sources familiar with the matter, the world's largest retailer and seller of movie DVDs is accelerating its efforts to launch a digital movie service in the months ahead. The quickened pace comes after both Amazon (Charts) and Apple (Charts) this month unveiled their own movie download services. 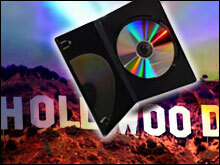 Wal-Mart (Charts) currently accounts for about 40 percent of all DVD sales in the United States. By launching its own service, industry watchers say Wal-Mart can protect that DVD market dominance. The retailer is still apparently debating price models. One option Wal-Mart is considering is a free digital download of the movie along with a purchase of the DVD version at a Wal-Mart store. Another option is letting customers purchase a download of the movie for a few extra dollars when they buy the DVD version at the store. Wal-Mart would make the digital downloads available through its Web site walmart.com, according to executives. A published report late last year said Wal-Mart was also considering installing in-store kiosks where consumers could use digital technology to download films on to portable discs. "We're more than happy to work with Wal-Mart to sell the content whenever they're ready to launch the service," he said. "The last time we talked with Wal-Mart a couple of weeks ago, our sense was that they had dropped back on this launch. But given Apple's move, it wouldn't surprise us that they want to get moving with it," he said. "It would make perfect sense for Wal Mart to sell DVDs in stores and coupons for digital downloads." Wal-Mart spokeswoman Jolanda Smith said she could neither confirm nor deny Wal-Mart's intent to launch a new movie download service later this year. "We believe many of our customers like to touch and feel the movies in-store and receive additional benefits such as the bonus features not currently available online. "We intend to meet our customers needs whether they choose to purchase movies online or in the store and will continue to work hard with all our partners to do that," she added. This wouldn't be the first time that Wal-Mart has attempted to make headway in the digital movie marketplace. Wal-Mart's online movie rental service failed. Walmart.com now refers customers to Netflix (Charts) for movie rentals. One analyst who covers Apple and who did not want to be identified, said Apple has priced its digital movie offering so low that competitors like Amazon and possibly Wal-Mart would be hard pressed to make any money from their service by further undercutting Apple's prices. Apple has said that new releases will cost $12.99 initially and $14.99 later, while older films titles will be $9.99. However, Wal-Mart might be able to extract value and pose a "significant challenge" to Apple if it does decide to bundle its DVD and downloadable versions, he said. Wal-Mart closed Friday at $48.22, down 15 cents. Apple unveils movie downloads, player. Warning to Jobs: Taming Hollywood not easy. Apple goes to the movies.